This elegant collection arrived last week. Unique colorway with just a tiny bit of metallic woven in. 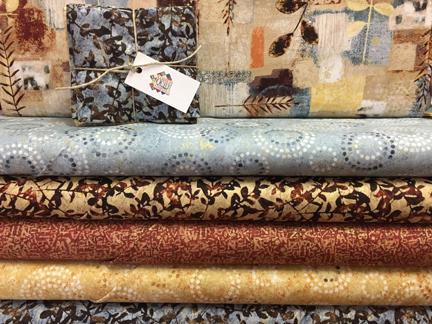 Traditional collection with an autumn theme. Reminiscent of Buggy Barn. Had no idea this was light-weight canvas when we ordered it. What a nice surprise! 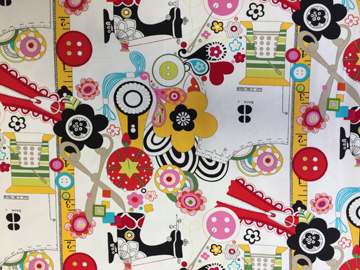 The large-scale print is perfect for a sewing tote or comfy pillow for your sewing room. The trick and the treat in this collection is that it GLOWS IN THE DARK! 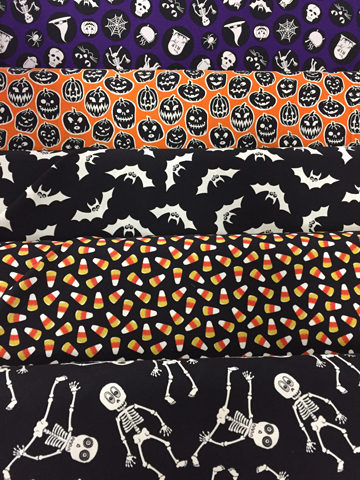 What fun for pillowcases, trick-or-treat bags, wall hangings, and Halloween costumes. Phone orders welcome for our out-of-town customers. 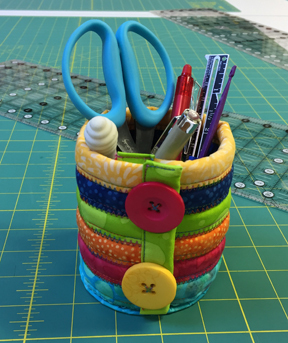 Make this adorable fabric holder and use it in your sewing room or at your desk to hold notions, pens, and more. No pattern is needed, and after you’ve made one in class you can adjust the size and make more. These will make great gifts! Judy Bryan will teach this class. 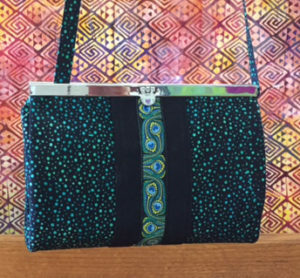 This adorable bag can be used as a large wallet, evening clutch, or small purse with a strap. Open it up to find two zippered compartments, several pockets, and a credit card holder. It uses the 7 1/2″ Diva Wallet Frame. Add ribbon on the outside for an extra splash of color or design. To finish this project in class you must do your cutting and fusing ahead of time. Judy Bryan will be your teacher. Learn two methods of provisional cast-on in our Friday Fiber Demo on June 2. When you need to seam work to another piece and need live stitches or want to pick up stitches along the cast-on edge later, the provisional cast-on is most helpful. Meet new friends as you knit or crochet at two ongoing events in our Yarn Shop. 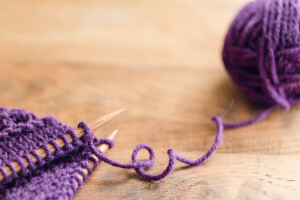 Every Tuesday from 2-4 work on a garment, and every Saturday from 2-4 work on a shawl or scarf. Get encouragement and ideas from your peers, and help from our expert staff if you run into a troublesome spot. Students will make these fun little keepers that can be used to hold keys, coins, power cords, remote controls, or whatever miscellaneous gadgets Dad wants to keep organized. 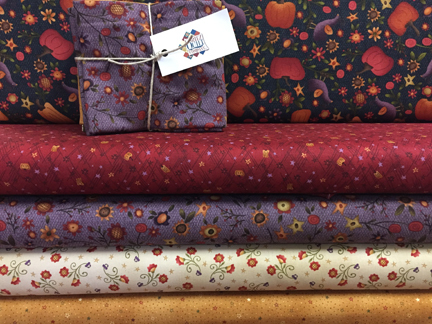 Picture these in more “manly-man” fabrics! Aimee King will teach this class. 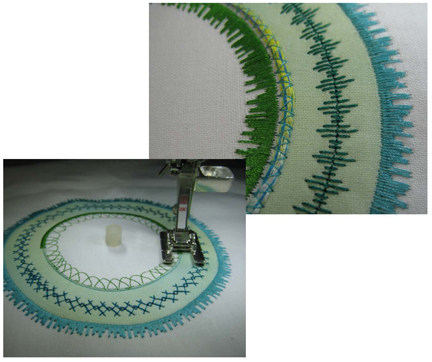 Using the BERNINA Circular Embroidery Attachment offers designer circular embellishments with decorative stitches, appliqué, couching, quilting and more. An attachment that works with most stitches, most presser feet and many techniques, it’s a tool worth learning about. 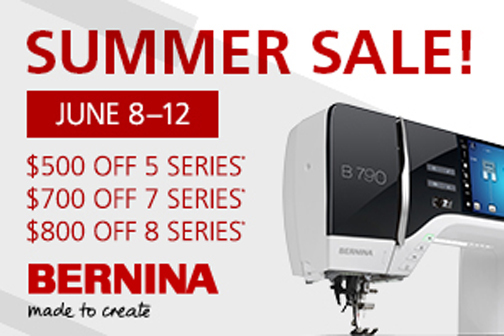 Works with all BERNINA machines. To RSVP please call 970-565-7541 or email Cindy. This week only take 20% off all hand sewing needles, machine needles, straight pins, and curved safety pins. Stock up while the price is right! Offer expires on Saturday, June 3 at 6 p.m. Limited to stock on hand. You must mention that you saw this offer in the Quiltzette to receive the discount.